Yo La Tengo performed at Carnegie Music Hall Wednesday night. Courtesy of Yo La Tengo's Facebook page. Gray man buns, velvet seats and antique organs set the scene for Yo La Tengo’s Wednesday night concert at Carnegie Music Hall. 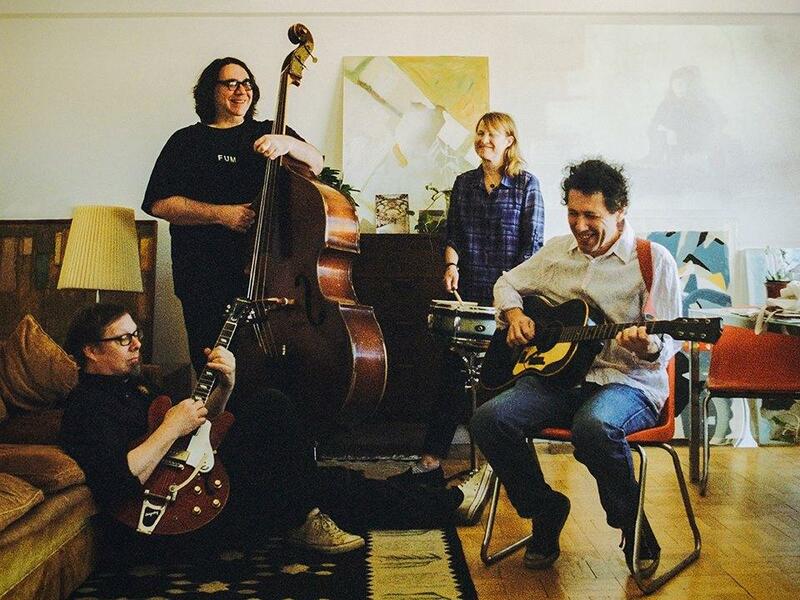 Yo La Tengo returned to Pittsburgh for the second time in a year. However, they performed this tour with all three original band members — Georgia Hubley with husband, Ira Kaplan, and returning band member, James McNew instead of just the the original duo. Rather than playing their most recent album, “Stuff Like That There,” as they did on last year’s tour, the band performed a spectrum of songs as old as they are. Once the opener, Lambchop, strutted on stage, the night took a strange turn. Lambchop is an alternative country performer who ended up complementing Yo La Tengo’s ominous sound perfectly with his own synthesizer. His only onstage decoration was a large amp that had the word “AMP” in all caps slapped to it. With his random and repetitive lyrics, the opener sounded like someone’s grandpa got a hold of an auto-tune machine and had the time of his life with it. Strangely enough, however, it seemed work for some audience members. Everyone in the audience was either trying their best to suppress a laugh or were totally captivated by whatever noises he was producing accompanied by a surprisingly beautiful voice. Although they didn’t perform their most famous cover song, “Friday I’m in Love,” the slow songs they did perform were flawless. The audience appeared to be in a meditative trance during “I’ll Be Around” and “My Heart’s Not In It,” the only song they played off their new album. The complementary vocal harmony and perfect instrumentation made for a great first half of their set as their ambient sound brought the crowd to a whole other spiritual level. Even though these soft harmonies have a hypnotic sound, they sometimes go from being mellow to downright boring. Yet right when it seemed OK to zone out and divert one’s attention, guitarist Kaplan threw in some unexpected guitar solos that woke the audience right up. However, no one could stay asleep for long as the show diverted in tone after the first few songs. During the second half of their set, the band was ready to rock, as they switched from acoustic to predominantly electric instruments. Many of their next songs sounded like a harsh, chaotic jumble of noises as they combined sounds of a synthesizer, drums, guitar, bass and vocals. Oftentimes there were guitar shrills so piercing they were mistaken for technical difficulties but actually worked as a part of their sound. While the audience sat in velvet chairs, Kaplan had a mosh pit of his own onstage. More than once his sanity was questioned by audience members as he outwardly and awkwardly struggled to swing his guitar all over stage. Much of the audience felt so uncomfortable, they averted their eyes and sank in their seats. At one point he even gave his guitar to an audience member to hold while he sang part of a song. Towards the end of their show, the band brought Lambchop back on stage for one of their more popular songs, “Autumn Sweater.” Lambchop’s synthesization worked well with the already noise-heavy song. He was also brought out for the last three encore songs. Yo La Tengo’s opener did a very good job of bringing to the stage every sound the band lacked and both — despite the crowd’s confusion earlier in the night— were rewarded with a standing ovation at the end of the performance. At the end of the night, Yo La Tengo and Lambchop put on a show that left audience members either completely satisfied or feeling as if they just awoke from a weird dream, but no one could say they weren’t at least entertained.